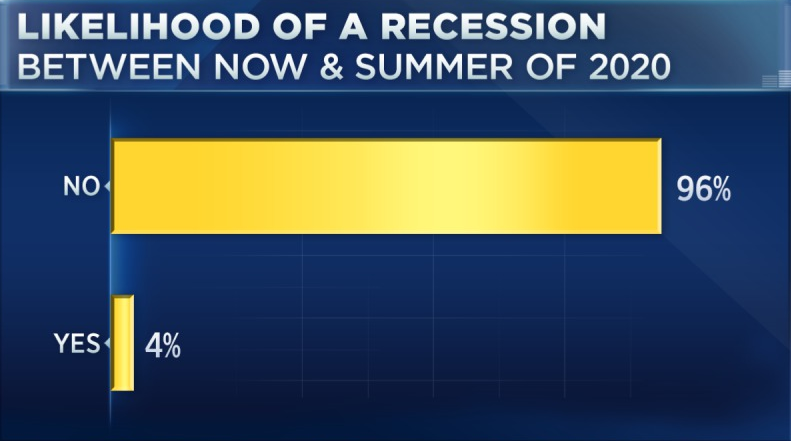 A majority of Wall Street pros said they don't forecast a recession by summer 2020, and more than 70 percent are optimistic overall, according to CNBC's "Halftime Report Stock Survey." More than half of respondents say Q1 earnings will top expectations, and nearly 80 percent believe the United States is still the best place to invest. Tech, health care and energy were top sector picks. The S&P 500 just posted its best start to a year in more than two decades, and according to a majority of Wall Street professionals, the market outlook remains positive. 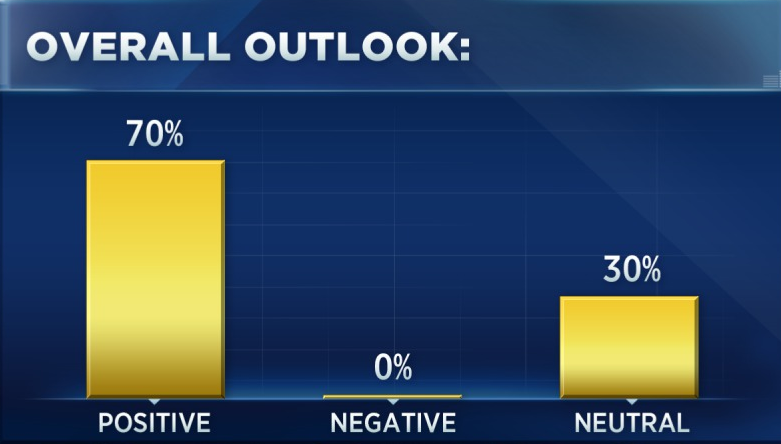 More than 96% of respondents to CNBC's "Halftime Report Stock Survey" said they do not see a recession in the next year, and just about 70% saying they are optimistic. Not a single strategist among the 27 respondents had a negative outlook. Just under 30% are neutral overall, which is lower than the 34% from last quarter's survey. The respondents included strategists, investors and traders who appear on CNBC's "Fast Money Halftime Report." Stocks started the year on a strong foot after a steep slide at the end of 2018. Fears that rocked markets in the fourth quarter — namely concerns over a global growth slowdown, uncertainty surrounding ongoing trade negotiations between the U.S. and China and worries that the Federal Reserve might be making a policy mistake — seemed to somewhat abate over the last quarter. Investors reentered the market in January, leading to a gain of just over 13% year-to-date for the S&P. And a solid majority — 81% — of respondents said they believe stocks are correctly valued. Just under 15% said equities look cheap, while less than 4% think valuations are stretched. Some Wall Street bears have cited a slowdown in corporate earnings as a reason to get out of the market, particularly after bellwethers like Apple and FedEx cut estimates. While Q1 earnings expectations may be negative — according to the latest data from Refinitiv growth is expected to contract 1.9% — a majority of pros are still optimistic. About 59% said they believe results will top expectations, with 22% expecting earnings to match estimates. Part of this optimism could be a belief that companies were overly conservative when lowering expectations. As Brexit uncertainty, weakness in Japan and falling German yields weigh on global markets, U.S. equities saw record inflows last month, according to Bank of America Merrill Lynch. While the picture in the U.S. might not be entirely rosy, three-quarters of survey respondents said it is still the best place to invest. Nearly 78% said they favor the U.S., with about 19% saying emerging markets is the better bet. The EEM, which is an ETF that tracks emerging economies, has gained roughly 10% this year. Tech is the top-performing sector this year, and a majority of respondents indicated that they believe the group will continue to lead. Nearly 78% called it a top pick. Health care and energy were two other popular choices, with roughly 48% and 30%, respectively, of strategists saying they look attractive at current levels. Health care did turn in a positive Q1, but its 6% gain lagged all other sectors. Energy is one of only two sectors still in correction territory — or more than 10% off its recent high. Financials is the sole other sector in correction, and just under 26% of pros saying they think there's opportunity in bank stocks. The Federal Reserve reversed course last month, indicating that there will no more rate hikes this year, after previously saying two hikes would be appropriate for 2019. After the yield curve inverted at the end of last month, some — including White House advisor Larry Kudlow — have even called for a rate cut. But the vast majority of survey respondents said they believe the Fed will hold steady — at least for the time being. About 89% said they expect the central bank to do nothing, with roughly 4% predicting a hike. 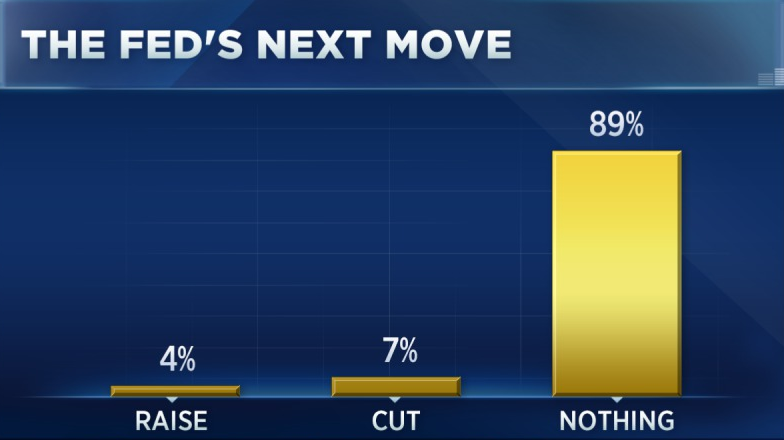 About 7% said they believe a rate cut is on the horizon.